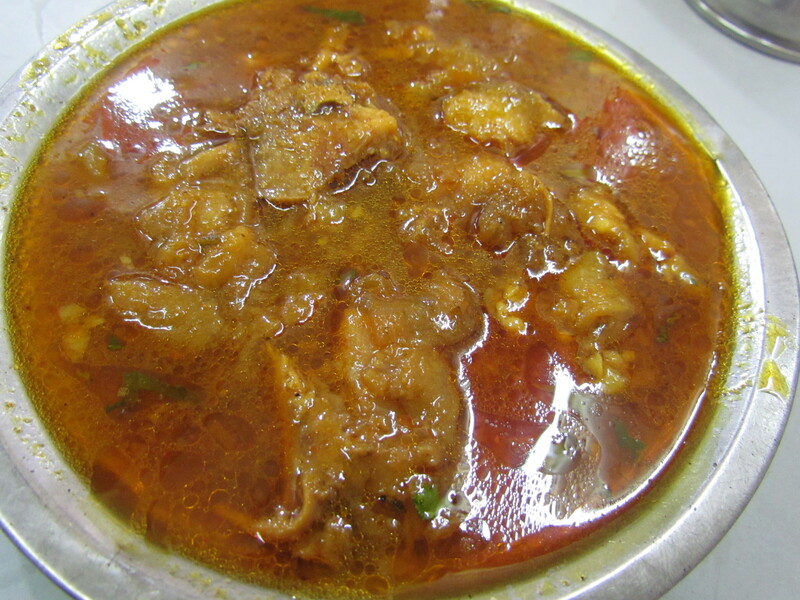 A super YUMM ‘bhar pet’ Mughal cuisine lunch for Rs. 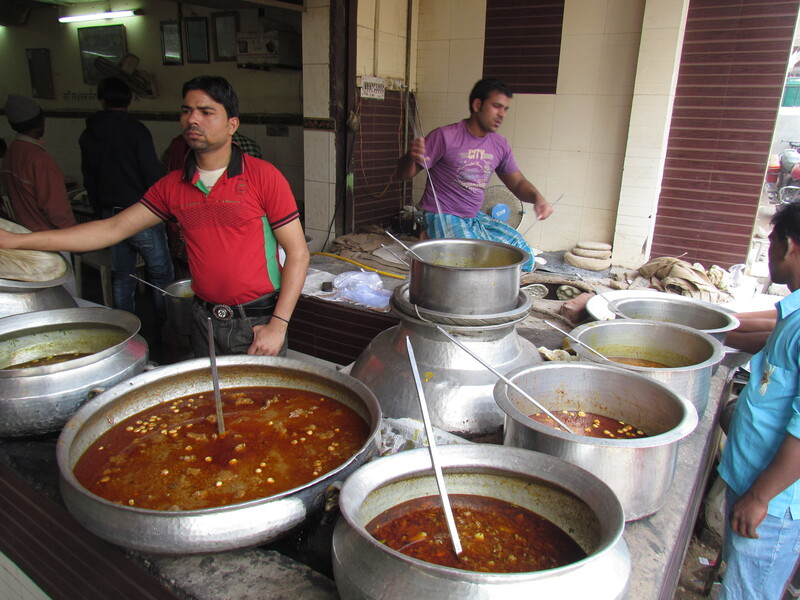 247 for 3 people in Delhi, with few dishes much better than the famed Big Boys of Mughal Cuisine like Jawahar or Karims. Address & other details: Pahalwan Dhaba is the second shop to the entrance of the Dargah of Sufi Saint Qutubuddin Bakhtiyar Kaki. Best way to reach here is to park ur car at Qutub Minar parking & take an auto to ‘Qutub Sahab’s Dargah’. Alternately u can park ur car at Mehrauli Bus stand & just walk to the restaurant. I first heard of this place from Asif, the guy behind Delhi by foot – they organize individual & group heritage walks in Delhi. I had asked about a good Mughal place around Qutub Sahab’s Dargah & this was his ‘on spot’ suggestion ‘without a blink’. So we visited this place today after driving back from a 3 hour heritage walk in Tughlaqabad area. Though it is winter in Delhi but a 3 hour walk (including climbing stairs) makes one hungry. So were we. 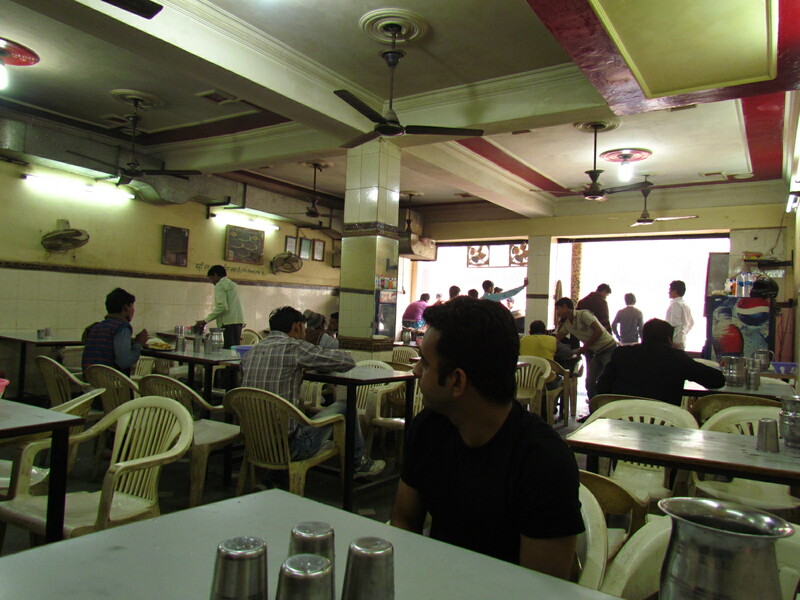 As the waiter came, we asked for options & he rattled – korma, bheja, keema, kaleji, chaap…………. & some more such stuff & then he also said daal, subzi etc. We were obviously on a strict nonvegetarian diet hence chose from the initial list. In some time we called him & ordered some more dishes. We saw that people in other tables were ordering one curry & eating many rotis with them. So, unused to such a situation in which 3 people are ordering 5 dishes, he was giving us bewildered looks. Post that when we called him for the third time, the serious guy in him gave up – he smiled & said ‘there is one more dish that we have, that u did not try today. Wanna try that?’. The restaurant also sells nihari, paaya & nalli in the evenings. Will go to try that some day. The Dining hall is pretty large & has the typical Jama Masjid area’s Mughal restaurant look – Simple furniture & tables very close to each other. 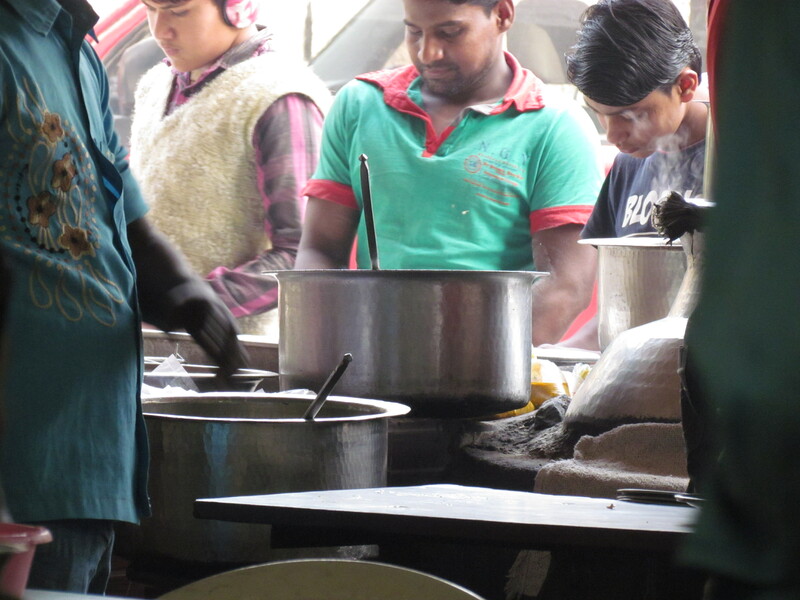 At the entrance to the dining hall is the open kitchen where tandoori rotis r being churned out. Huge containers with different kinds of curries r also being kept here on constant slow fire. The waiting staff r obviously not trained in the ‘modern way’. They behave like normal human beings – good behaviour is reciprocated with good behaviours, warmth & humility & bad / cold behaviour is reciprocated with cold behaviour. We were pretty happy on this front. Food was obviously good – Not even one was bad or average. Some were just outstanding & surely better than what the Big Boys of Jama Masjid area serve. Prices were so low that we were shocked when the bill came. Our first set of 3 curries were bheja (brain curry), kaleji (liver) & korma. I have had bheja so far only in Karim’s Delhi & Nizam Kolkata. I did not really find it outstanding & hence never tried that too many times. My friend & co diner has had the opportunity to have good bheja at Jamia & hence he insisted we order. 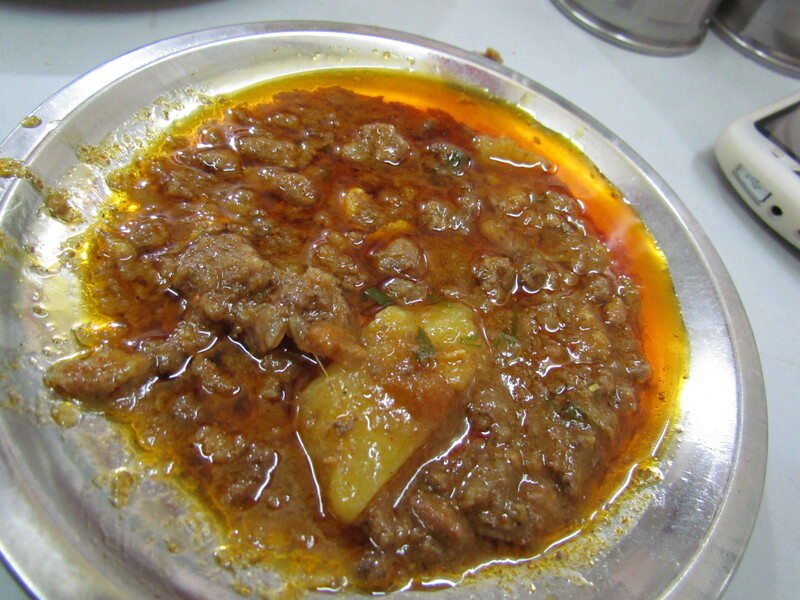 This bheja curry was awesome – the Karim’s one is 2.5/5 if this is 4.25/5. The flavours of masala had intermingled with those of the bheja. The taste was excellent as well. Recommended. The Kaleji was excellent again. Not hard not soft but just rightly done Kaleji, the overpowering flavour of spices & the overall taste leads to a rating of 4.5/5. The Korma was good but was the weakest of all. The meat was soft but fibrous. The gravy was a bit thinner than expected. The korma of Old Jawahar hotel was spicier, hotter & thicker than this. I wud rate this a 3.5/5. Our second set of curries were chaap & keema. The chaap gravy was again very very good. The meat was again soft but fibrous. The fine flavours of spices were enjoyable to the extent that we finished off the gravy till the last drop. I wud give a 3.5/5 to the meat & 4.25/5 to the gravy, averaging to 3.9/5. The keema was again good but not beyond good. Its gravy was relatively subtler / non intense than the others. The keema pieces were a bit bigger than usual – maybe that had led to the taste not being as intense as desired. I wud rate this 3/5. At this point we decided to reorder the kaleji which was equally good as the first time. As we were almost thinking of ending the meal, we overheard ‘paya’ in another table. So we asked about paya & were told they have a little bit left. When served, we realized it was cold. So we told them about it & immediately a new one was served. The paya was good, not over spicy, not hot, subtle, enjoyable. It is surely not as decked up as the paya at Karim’s. I wud give this a 3.75/5. The best part of the 6 dishes we had was that each was very different than the rest. 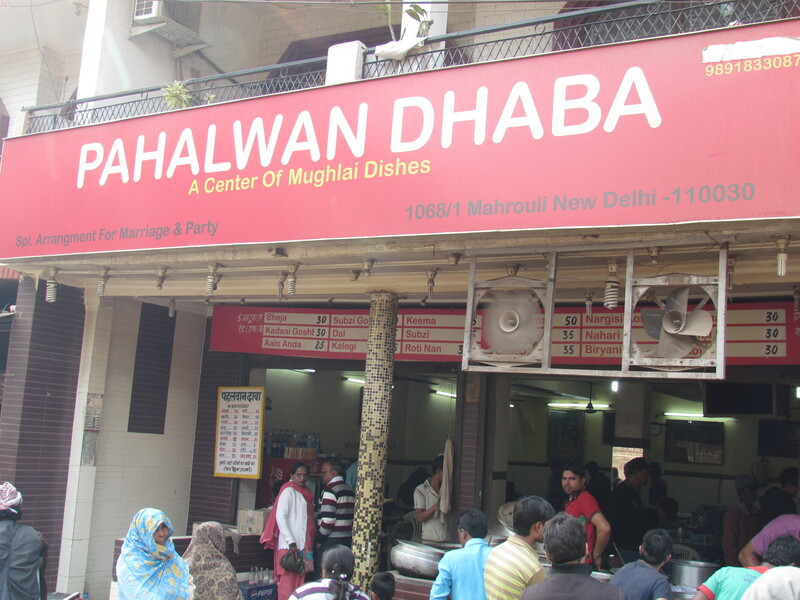 Score for food at Pahalwan Dhaba adds up to 3.9/5. I wud surely revisit & wud strongly suggest foodies in general & meat lovers in particular to not give this a miss. Pls note that most dishes r beef & chicken based. Nice description.. Will taste soon..
hope want to get down at qutab minar metro and take an auto or bus, right??? If u take metro, u will have to take an auto / grameen seva to Qutub Minar 1.5 km. From Qutub Minar u will hv to go to Mehrauli bus stand – 1 km. all buses going to mehrauli / auto. very good article & i feel it. Would you like to come in ballimaran to taste habshi halwa sohan also. this is winter sweet only. 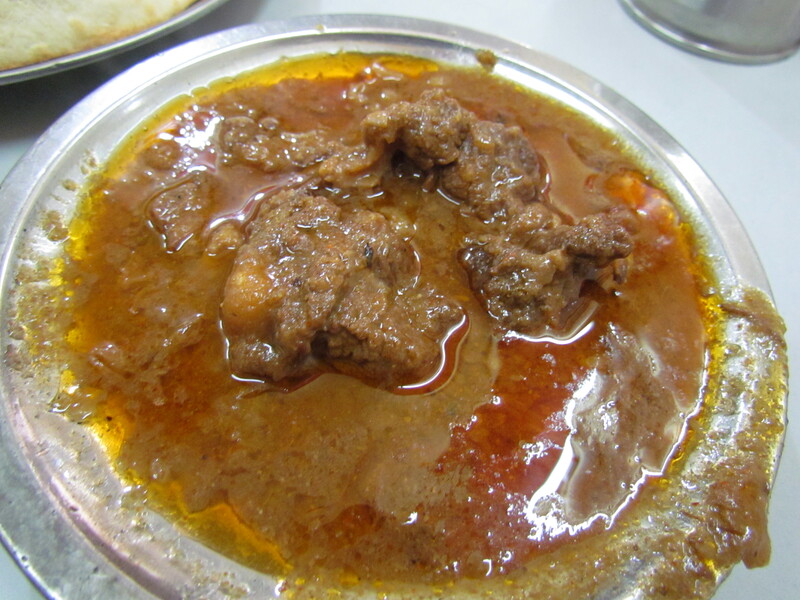 Bhai Yummraj, I live in the UK and have been searching all over for a decent recipe for Dilli Nihari, of which I have distant childhood memories. Would you please point me in the right direction ? I looked in “Essential Delhi Cookbook”, in Nita Mehta’s Dilli ka khana and searched on the Web, all to no avail. I came across this blog of yours and thought that if anyone would know the answer then that person would most likely be your good self. Many thanks indeed. May I suggest one more item to add to your foodie ‘to do’ list (if you’ve not already done so) ? 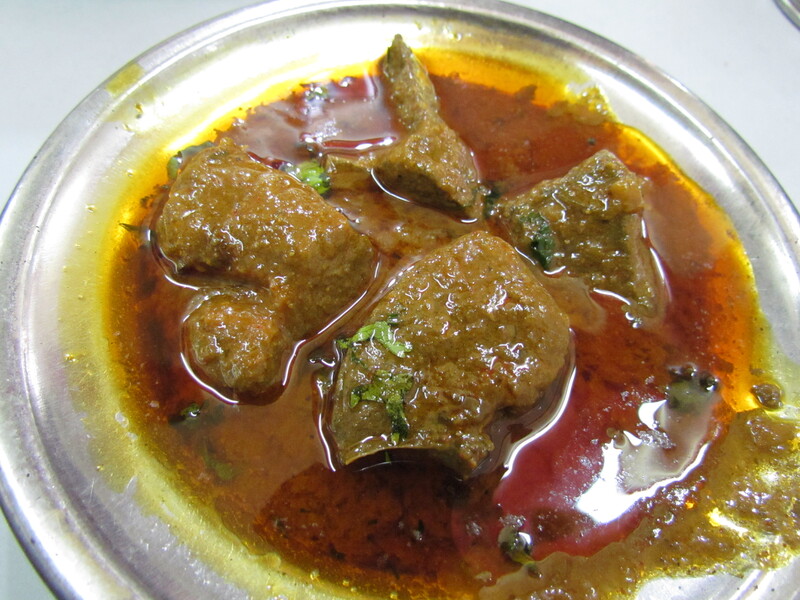 Gurday Kapooray (Literally Kidneys & testicles, but it’s a general term for meat & offal cooked together). 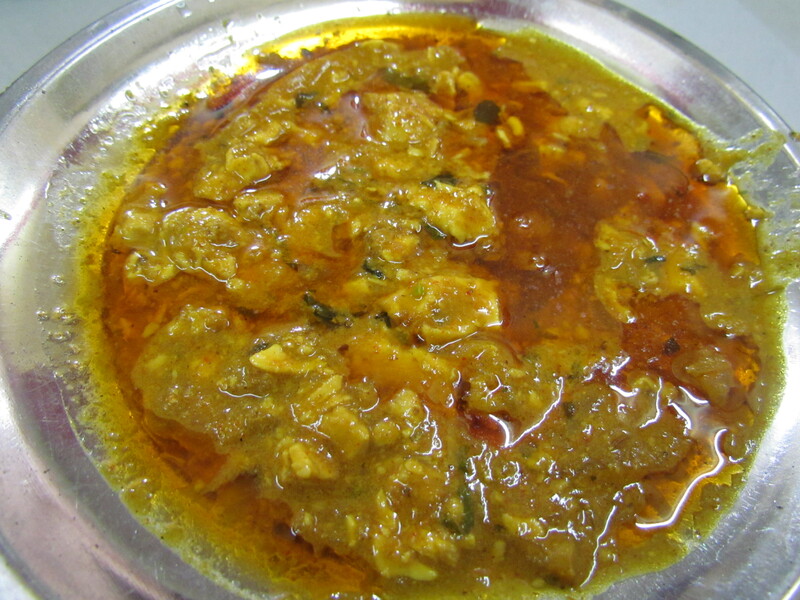 Its made in usli ghee with tomatoes, onions, spices & hara masala and is quite delicious. Its a Punjabi dish. Mutton Nihari made at home in a slow cooker. Add the mutton, half the ghee, nihari spice mix, ginger paste, garlic paste, salt and about 1.4 liters of water in a slow cooker and place on high. Once the nihari comes to a boil, reduce the slow cooker to it’s lowest settings and let it simmer. 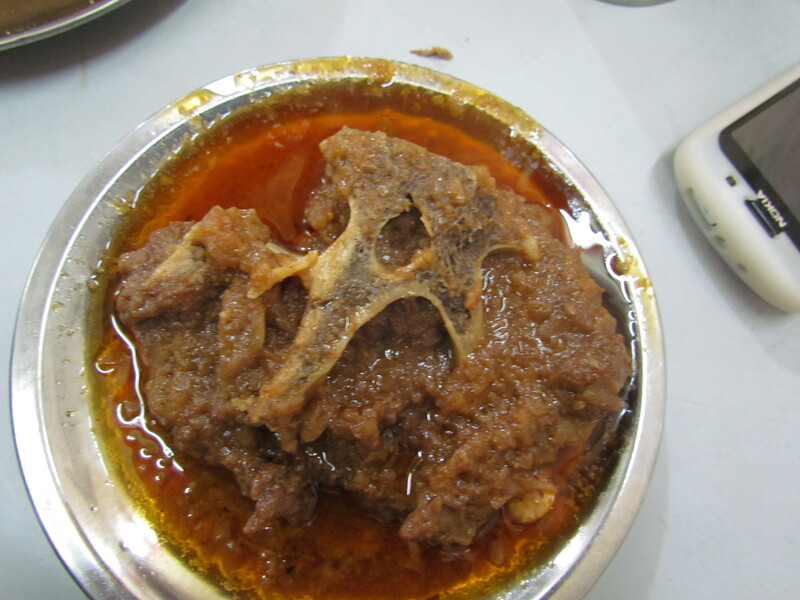 After about 10/12 hours, dissolve the atta in a cup of water and make a slurry and add it to the simmering nihari. Heat the remaining ghee and fry the chopped onions until golden brown. Drain and add the fried onions to the nihari. Cook for another hour or two. Serve piping hot garnished with finely sliced chillies and ginger. Enjoy with tandoori rotis. Kamal saab, my heartfelt thanks to both yourself and to Anurag_ji for your kindness. I am looking forward to the weekend, when I will try out this recipe. Tried out this recipe. I used beef, since goat meat (known as mutton on the subcontinient) is hard to get in the UK. The result was superb, the real deal. Just as I remembered it from my boyhood. So, thank you again, messrs Yummraj & Kamal. Here is my take. Just came back from the place and most adventurous was the ride back. We got lost in the labyrinth and surprisingly came out to civilization at a truly unexpected place. For minnows, the key word is Mehrauli bus stand and from there ask for Pehalwan. Now the food. As per your recommendation, I alone had bheja, kaleji and nehari. Wanted to try our paya too but they didn’t had it. As you said, I was the only guy having more than one dish for one person. If you don’t want to spend too much (I just spent Rs117 for all that, 4 rotis and a coke) they offer free gravy of whatever item you have ordered. Food, if not great, was not bad too. Buts its the best I have had in Delhi in that class (Karim is a different class so no comparison). I might go there again with a few cousins but its not a place for week hearted. Thanks for trying it out, Ahmad. & more importantly for sharing ur thoughts the way they came to u:) Am feeling good. Thanks Yummraj1 This is a treasure trove. just my kinda place. All these dishes are beaf I suppose. Or is it mutton? you should also try JNU’s Mughal Darbar sometimes! Visited is yesterday. Ordered bheja and nihari. Bheja was outstanding but nihari was not upto the mark. I have visited here on 21.5.17. And have some meal here very good quality food, clean and fast service. In very cheap price. Delicious food. Thanks to yummraj to guide us.